Didn't see the moment of capture as John Charles was crashing and rebooting. But it sounds like it all went well with Kjell Lindgren plucking the cargo vessel from its orbit with the Canadarm2. I heard, "And there was much rejoicing," as I reconnected to the NASA TV stream. Good stuff. 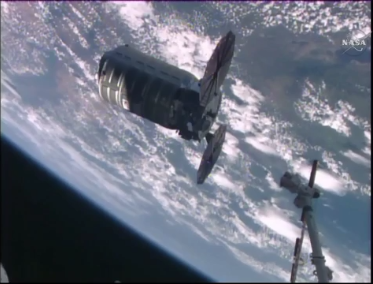 The Cygnus craft will be docked to the nadir port of the ISS in about 1 hour.